For each visitor to this website, we expressively collect the following non-personally identifiable information, including but not limited to browser type, version and language, operating system, pages viewed while browsing the Site, page access times and referring website address. We use this information solely internally for the purpose of gauging visitor traffic, trends and delivering personalised content to you while you are at this website. There are many aspects of this website which can be viewed without providing personal information. However, for access to support features including but not limited to email enquiries and online bookings, you are required to submit personally identifiable information. This includes disclosure of your personal information such as your full name, email, mobile phone number and date of birth. Helping Hands Osteopathy’s patient database and management system uses this information to verify your identity and confirm your appointment when booking online. We may also use the information you provide to respond to your enquiry or online booking if required. From time to time, we may use patient information for new, unanticipated uses not previously disclosed in our privacy notice. If our information practices change at some time in the future we will use for these new purposes only, data collected from the time of the policy change forward will adhere to our updated practices. We do not share, sell, lend or lease any of the information that will uniquely identify a customer, patient or subscriber (such as email addresses or personal details) with anyone except to the extent it is necessary to process transactions or provide services that you have requested. The personal information you provide via this website or in person at the clinic may be collected, used and disclosed by Helping Hands Osteopathy including but not limited to the following reasons: to manage and maintain your health record within our patient database and management system; for communication with you via phone, sms, email and social media; for communication with any of your preferred external healthcare provider(s); for use by all practitioners at the clinic; for additional services that might benefit you including but not limited to exercise rehabilitation programs, for occasional informational/promotional newsletters via email, processing transactions, discussion with third-party insurers where necessary and for legal disclosure as required by law. Helping Hands Osteopathy may occasionally hire other companies to assist us to provide services for customers and patients on our behalf. Those companies will be permitted to obtain only the personal information they need to deliver the service. 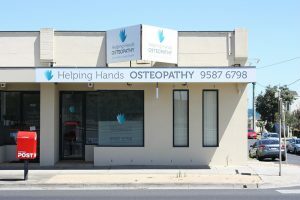 Helping Hands Osteopathy takes reasonable steps to ensure that these organisations are bound by confidentiality and privacy obligations in relation to the protection of your personal information. Helping Hands Osteopathy may disclose information when legally compelled to do so. In other words, when we, in good faith, believe that the law requires it, or for the protection of our legal rights. We may also disclose account information when we have reason to believe that disclosing this information is necessary to identify, contact or bring legal action against someone who may be violating our Terms of Service or to protect the safety of our users and the public. Children are advised not to use this website unsupervised. We ask that children (under the age of 14) do not submit any personal information to us. If you are under the age of 14 years, you can use this website only in conjunction with permission and guidance from your parents or guardians. You always have the option to subscribe or remove your name and email address from our e-mail Newsletter list. In order to ensure removal from any list, please follow the instructions within the communications that you have received from Helping Hands Osteopathy which you no longer wish to receive. Security for all personally identifiable information is extremely important to us. Unfortunately, no data transmission over the internet can be guaranteed to be 100% secure. As a result, while we strive to protect your personal information, we cannot ensure or warrant the security of any information you transmit via the internet. By transmitting any such information to Helping Hands Osteopathy, you accept that you do so at your own risk.